A small but enthusiastic group of birders met yesterday morning to explore these under-birded preserves. 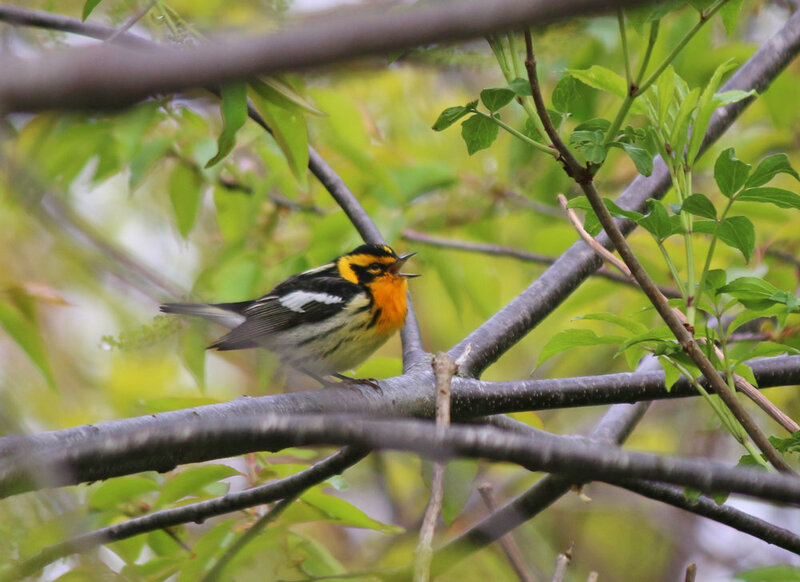 The weather was perfect and a singing Blackburnian Warbler greeted us in the parking area for Whistler Woods. A Mourning Warbler was singing emphatically but stayed hidden in the understory. The nesting birds were very vocal with Eastern Wood-pewees, Great Crested Flycatchers, and Baltimore Orioles singing every step of the way. A Northern Parula was singing its rising buzzy song from the tree tops, this late in the season, it could be on territory. A Wood Thrush was singing its haunting, melodic song from high up, another sign of potential nesting. With vernal pools on either side of the trail, the later migrants like Canada and Wilson's Warblers were filling up on insects. We had a couple beginner birders with us who had great opportunities to match vocalizations to the birds giving them which is one of the best way to remember songs and calls. One eagle-eyed observer spotted a Cecropia moth which appears to have recently hatched from its cocoon and laid eggs. Definitely one of the trip highlights. As we reached the edge of the woods and walked out to the bridge that overlooks the Calumet River, a male Indigo Bunting serenaded us while a couple of recently fledged Killdeer chicks took cover. Swarms of Cliff and Barn Swallows were gathering mud and flying in and out from under the bridge. A flock of Monk Parakeets flew over offering great views of their bright green bodies and contrasting blue secondaries... the beautiful colors making up for the noisy calls. We continued onto Kickapoo Woods where there were a lot more people out and model airplanes were flying. The change to a more open habitat brought us a bit more diversity, however. Alder Flycatchers were advertising "Free Beer!" and Gray Catbirds were having territorial disputes, as were the Eastern Kingbirds. A Common Yellowthroat was witchity-ing nonstop, and a Black-throated Green Warbler put on a show just off the trail. A male Eastern Bluebird was singing, with a female following close behind. All in all a beautiful morning to get out, and great company as well! Both Whistler and Kickapoo Forest Preserves can be found south of the Calumet River on Halsted St in Riverdale, IL.